MUST has already engaged in numerous projects with the Dalhousie based MicroReseach team and most have involved child and maternal health. Together they have launched a number of projects that are described as having “tremendous impact at the community level and policy influence in the area”. MicroResearch was started in Mbarara in 2008 by Drs. Noni MacDonald and Bob Bortolussi from Dalhousie University/IWK and the Dean of Medicine at MUST. What is MicroResearch? MicroResearch supports local health professionals and community colleagues coming together to find solutions for local health problems and grows local research capacity to find solutions for other health problems. It grows and supports a local culture of inquiry and stimulates longer-term interest and activity in research. The concept involves small locally driven multidisciplinary health research teams participating in research training workshops with hands-on research proposal development. The team helps local community workers to ask the questions that will address their problems and then to implement the actions themselves. It is grass roots, participatory action work! In all MicroResearch cases to date, community impact has been clear – e.g., significant decline in infant mortality from infections after a locally driven shift in rituals of umbilical cord treatments. 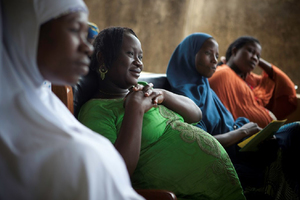 The local midwives were part of the initial project definition and they lead the communication process for change – a much more effective approach than having the Canadian leaders urge for change. What will the projects do? The details will be determined collaboratively with the research team including the local stakeholders. The effectiveness of the MicroResearch approach is that the leaders from Dalhousie do not impose a specific question/issue on the local stakeholders but rather leave flexibility in the definition of the question to the team for collaborative agreement. Interestingly, the approach has been so effective in Africa that the leaders have brought it back to Nova Scotia and workshops held in the Valley and Halifax have involved several local Rotarians. How can we help? Each project costs C$2000 to launch and the Rotary Club of Mbarara has committed to support 18 MicroResearch projects with a contribution of $300 towards each of up to 6 projects/year for the next 3 years. To fully support each of the 6 projects per year, they need an additional C$1700/ project and the RC Mbarara has approached our District to be their partner. Several clubs have already made commitments but we are not there yet! Are you ready to jump onboard? Want to learn more? Charles Kazooba is coming to Canada and he will be in Halifax for a few days in September. He and Dr. Bortolussi from Dalhousie will be presenting to the RC Halifax Harbourside on September 7th and if you are in the area, you are welcome to attend. Or, you can contact Louisa Horne who can link you to the researchers at Dalhousie/IWK – rotarylouisa@gmail.com.